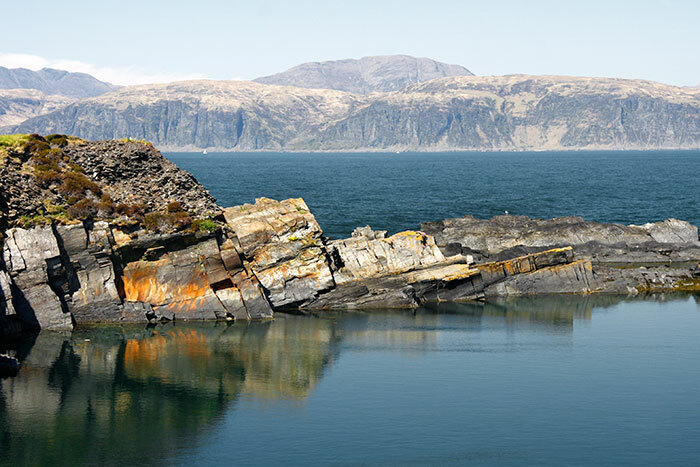 The Slate Islands of Easdale, Seil, Luing and Belnahua lie off the west coast of Scotland south of Oban. 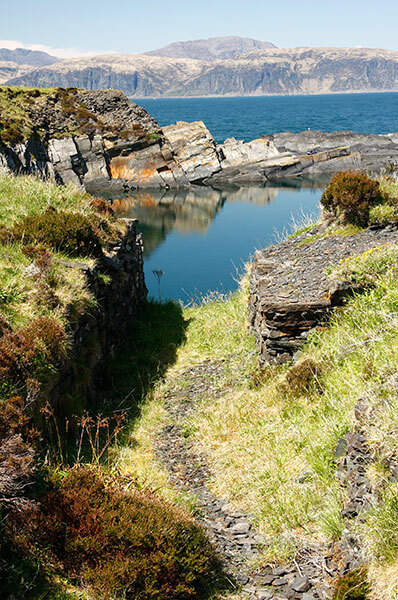 A long narrow channel at the Isle of Seil's north-east edge is crossed by “The Bridge over the Atlantic” to the mainland. Ellenabeich village is set at the island's western tip. It's a small village with white painted terraced and detached cottages once inhabited by the workers employed in three deep slate quarries. Excavated close to the sea, this one was breached and flooded by a severe storm in 1881. 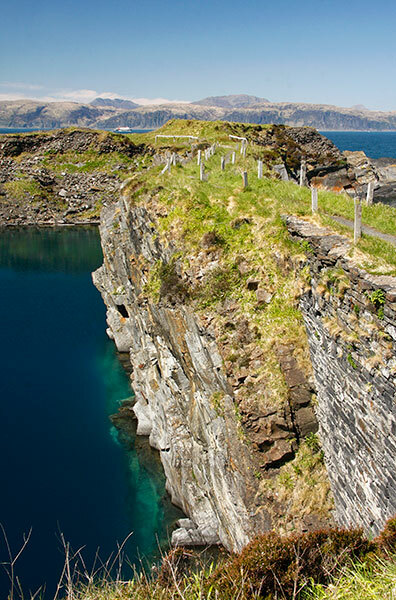 The working floors in the quarries here and on the adjacent Easdale Island were up to three hundred feet deep. They operated from c1750 to c1950. 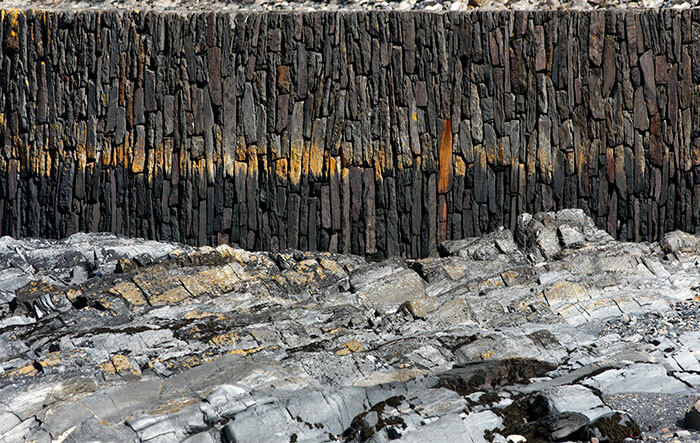 Around five hundred miners were employed at the end of the nineteenth century and some ten million Easdale roofing slates were exported annually across Britain and beyond at that time.This pier wall was built on a quarry edge: the Firth of Lorn, Mull and the open Atlantic Ocean lie beyond. Set at right angles across the end of the pier but no longer connected to it, this timber jetty once accommodated pleasure steamers pausing briefly on their west coast voyages. 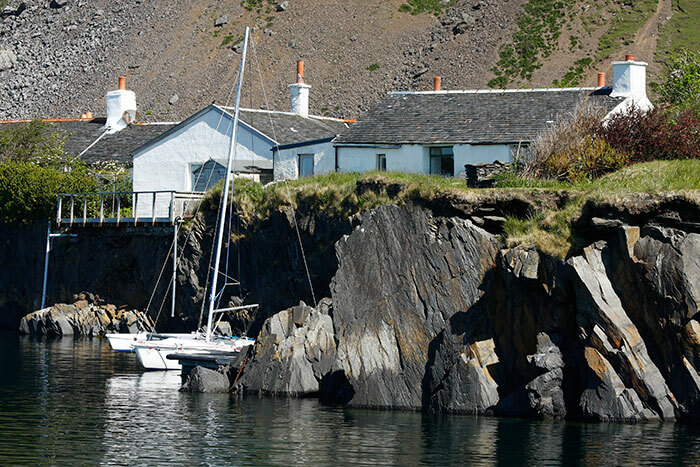 White cottages surround the harbour on Easdale Island; slate waste spills into the sea. A small outboard motored open boat embarks passengers crossing the narrow Easdale Sound. 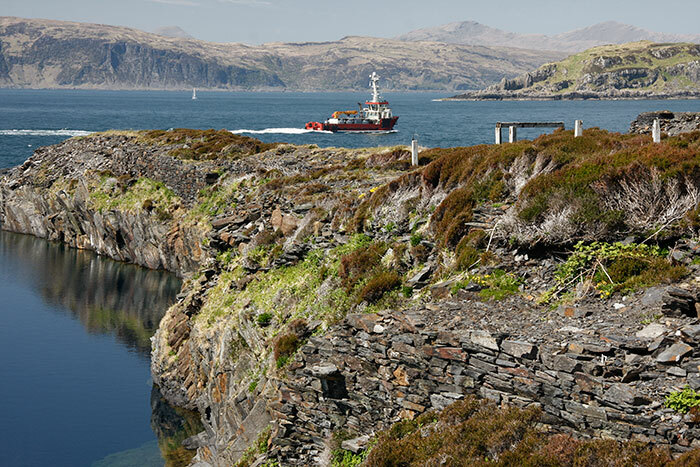 Ellenabeich harbour has little mooring space and ferry boarding is from a sloping ramp protected by the pier. 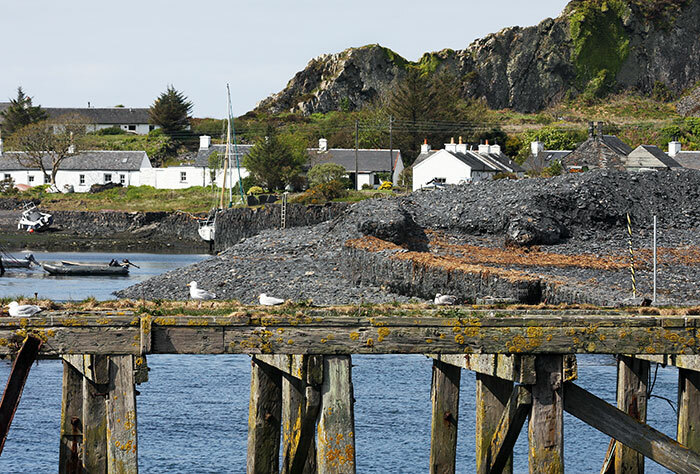 Turning out into the Easdale Sound brings the pier's seaward face into view. This long structure is both beautiful and impressive in construction. Founded on bedrock, the complete height is visible at lower tide levels. The deep open joints between the stone slabs enhance both colour and texture. The abundant stone has also been used to build imaginatively patterned dry stone walls around village gardens and open spaces. Further out, the upper strip of stonework has been heavily pointed with mortar. Westerly gales must force heavy seas through the tapering strip of water between island and mainland. A crossing in wind and waves would give a more stirring experience than these calm waters. 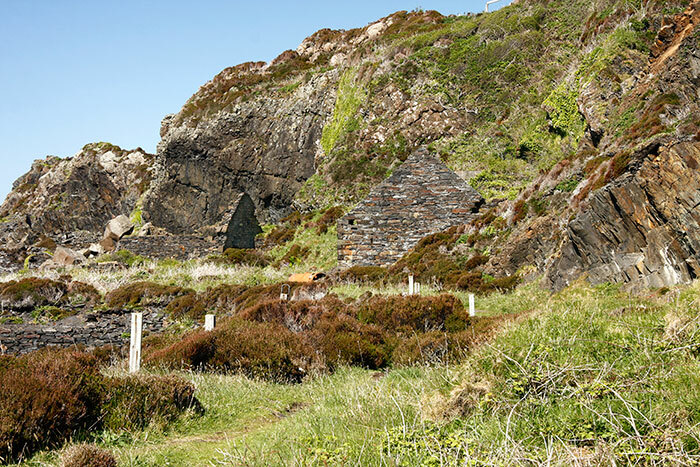 A cottage in the village is operated by the Slate Islands Heritage Trust as a museum and information centre on quarrying and the local environment. Fascinating collections of objects, photographs and documents show an environment and way of life greatly changed today. The narrow entrance to the island harbour opens out to provide moorings and small quays. This cottage is set against a high rock ridge to the northwest that offers spectacular views from its summit. The horizontal line to the left of the chimney stack marks the course of part of the narrow gauge railway system that once linked the various quarry workings. Free of motor vehicles, it's the smallest permanently inhabited island in the Scottish Hebrides. 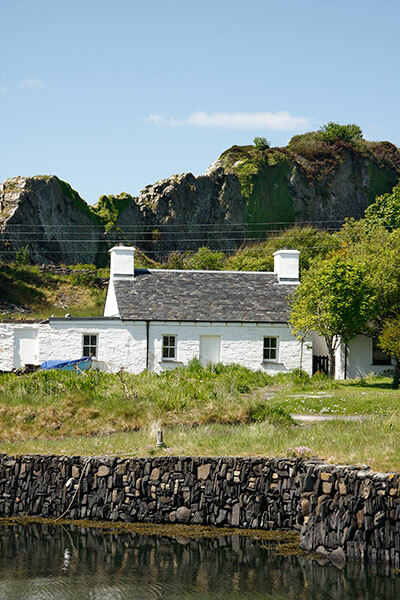 Photographs, artefacts and personal memorabilia are displayed in the Easdale Island Folk Museum. The remaining photographs were made on a walk around the island starting to the right of the cottage in the previous image. 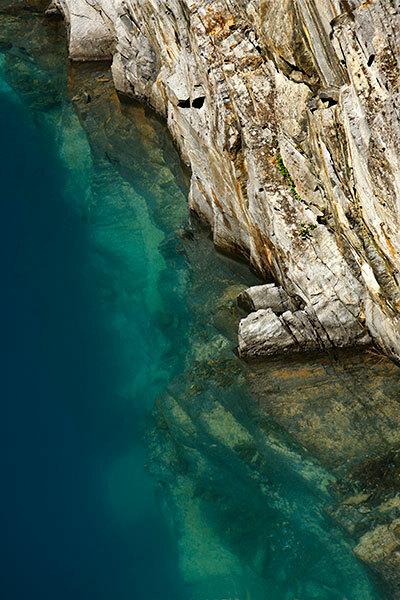 There are two deep quarries to the south of the harbour and five on the island's northern shore. It looks as though stone was also cut from the rock ridge. This masonry structure overlooks the largest of them and may have once have carried a spur from a tramway route behind the camera. Mull and the Firth of Lorn back the sheer quarry wall. Flooding from the sea was always a hazard to the deeply excavated working floors. 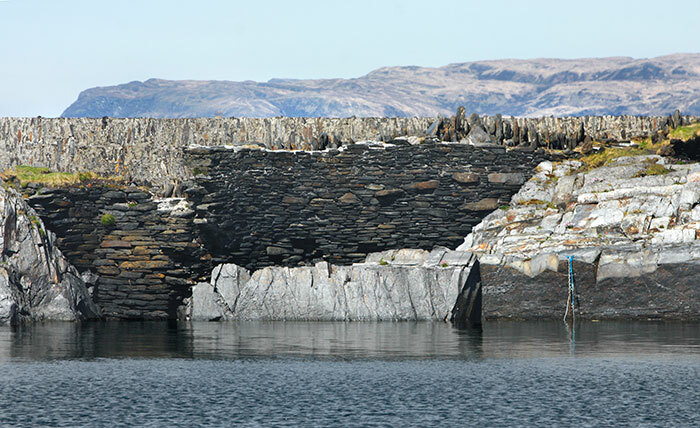 That and growing competition from other slate centres such as Ballahulish near Fort William to the north as well as England and Wales led to declining fortunes in Easdale and the other Slate Islands. Here, an eroding edge of dumped slate spoil is balanced on a small area of ground. The quarry in Images 07/08 is divided from its neighbour by a tall and narrow rock wall. Once carrying a tramway it's now a footpath. A small roofless building and what might have been a concrete mount for a crane stand close by. 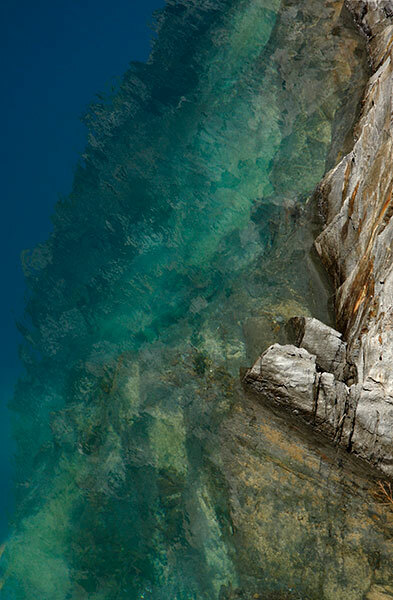 Bright sun and a clear sky illuminate the rock face and create the blue in the deep water. Surviving contemporary photographs show the impressive depths reached by the quarrymen with little mechanical assistance. Their working conditions would not be acceptable today. 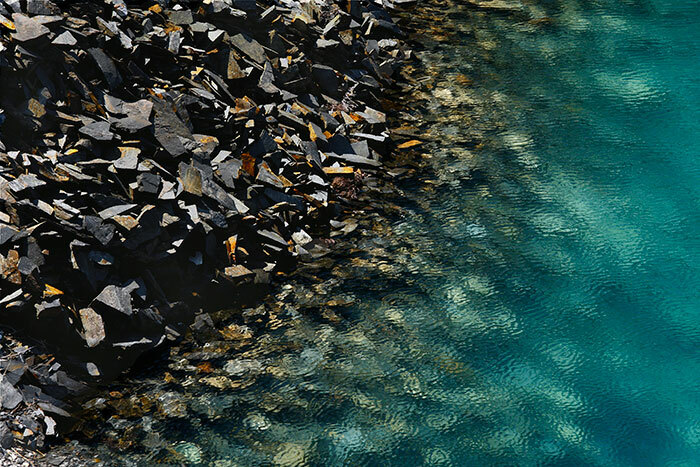 Gentle air movements disturbed the water surface to give this painterly image. Spoil heaps to the south spill into the quarry to form this vast scree. Visually, the angular blocks contrast well with the breeze-driven ripples. The flat and sea-smoothed slate fragments on the shorelines around the island provide ample choice for throwers competing in the annual World Stone Skimming Championships. Information, rules and results are posted online at stoneskimming.com. In 2013 the 60 or so Islanders were joined by over 300 competitors and 600 spectators from across the world. At the end of the dividing ridge the footpath turns southwest between the high rock viewpoint and the north shore quarries. The largest pieces in this pile are beyond single-handed movement. It was a chance to look more closely at the blues, reds and yellows tints and the textures created by the digging and splitting processes. 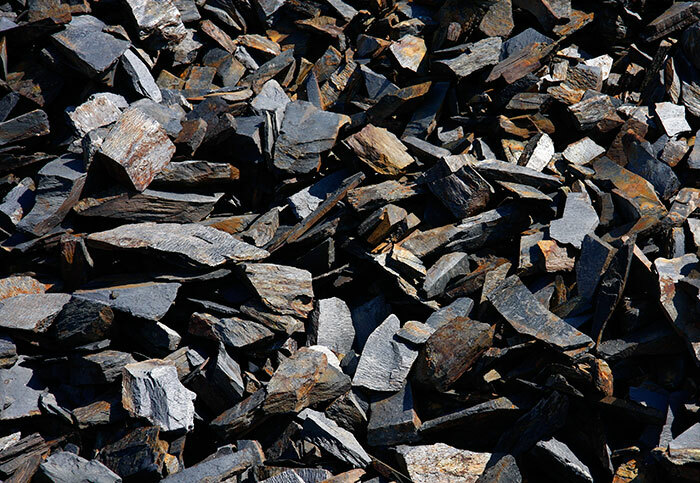 Easdale slate is characterised by embedded iron pyrites crystals that can still identify the origin of slates on buildings far from the island. 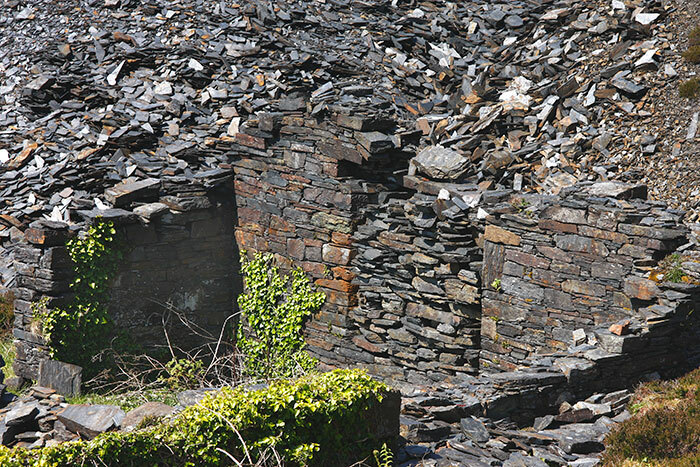 There are a few roofless buildings left from the many that must once have served the workings. One associated with the tramway operations survives intact and is used by an Island business. The gable of this one provides a barrier to the encroaching rock waste. I'm intrigued by the carefully assembled infill to the window embrasure. Walking on a little, I turned around to photograph that building and a second one set either side of the steep and stepped path to the viewpoint high above. The nearer fragment is perhaps a gable to one of the pumping houses used to clear water from the quarries. A large rusting cylinder lies part-buried in its collapsed side wall. The foreground ribbon of masonry marks the rim of another quarry. A finger of rock with retaining walls and spoil divides two quarries. Small waves breaking on the shore and bird calls created the only sounds at this the most isolated part of the island. It's difficult to imagine how different it would have been when standing here a century ago. A ship heading for the Sound of Insh dividing the small Eilean nan Caorach from Siel was a reminder of present time. 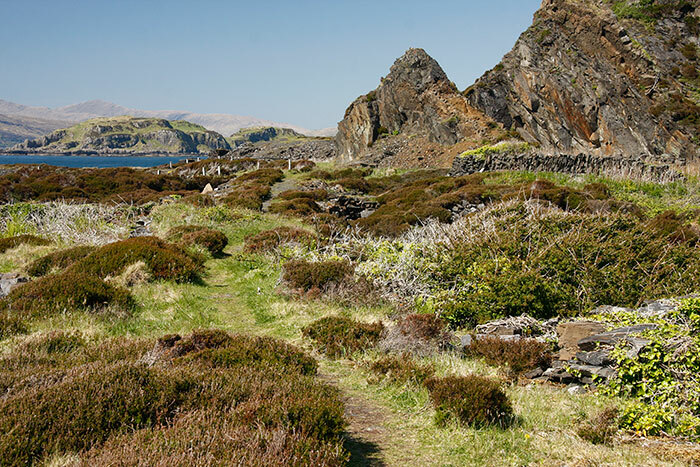 There are extensive stone dumps on the western shore reached by this footpath worn into the raised track bed of of the narrow gauge railway system. It passes through an area with a patchwork of low walls that might once have enclosed gardens and domestic animals. Some could be identified as the base walls of demolished buildings. 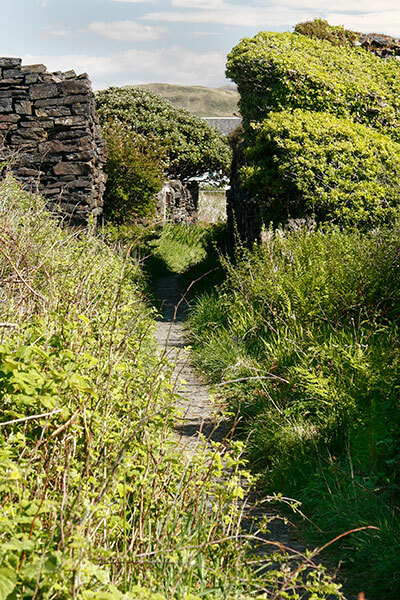 Another footpath leads between stone abutments to a bridge that carried a tramway built diagonally across the centre of the island. The masonry to the right is closer to the original working height of the tracks. Cottages on the western fringes of the village come into view here. The island is a beautiful and peaceful place worth an extended visit, especially for photography.